I am so glad I live in a world where there are Octobers. Aren’t you? Fall is my favorite season; beautiful colors, cooler temperatures, and delicious food. Fall is also a time for me to do a little housekeeping. I am back inside with my kids, after spending just about every daylight hour with them outside this summer. I like to do a little organizing, deep cleaning, and a check a few of those yearly to-do’s off of my list. October also happens to be fire safety month. It’s a great time to teach my daughter a little about fire safety and change my smoke alarm batteries, one of those to-do’s on my fall list. This is how I am teaching fire safety through play. My oldest daugher is 4 (4 and three-quarters if you ask her) and she loves school and board games. This kid is so curious, asks a million questions, and wants to learn and help with everything she can. I bet you have or know a child like this too. Kids want to learn about the world around them, we teach them to follow rules and they will gladly help us and keep us accountable. 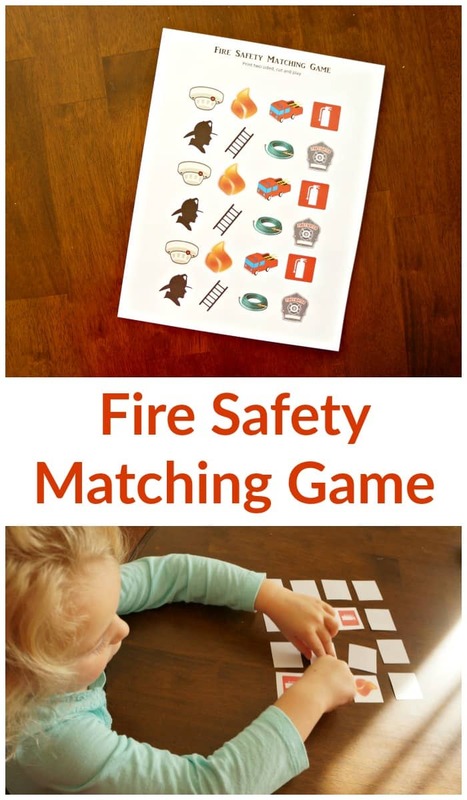 This month I am teaching my daughter about fire safety with a matching game. 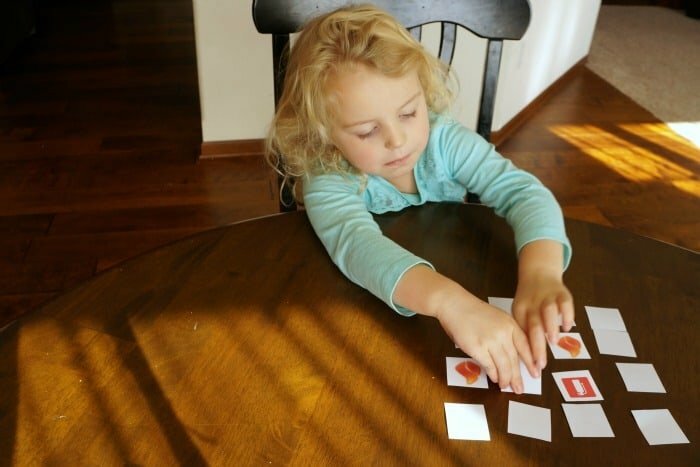 This simple game features 8 images that make great talking points. As we sat down to play the game we talked about how smoke detectors work, what to do if there is a fire, and how fire fighters help us. It was a great conversation. The game helped us focus and stay on track while keeping things fun. When talking about smoke detectors we took a break from our game to find the smoke detectors in our home. We tested them so she could hear the sound and talked about how important it is to make sure they work so they can do their job. A non-functioning smoke detector in a home can greatly increase the risk of death in a fire. Time is precious and a working smoke detector saves lives. It is estimated that 71% of nonworking smoke detectors had a missing or disconnected battery. Energizer® and the International Association of Fire Chiefs started the Change Your Clock Change Your Battery™ program when they realized how important a fresh battery is in saving lives. This program is in it’s 28th year and encourages families to check and change their smoke detector batteries every year on November 1 when they change their clocks. It’s a simle task that is easy to remember. Talking with my daughter about the Change Your Clock Change Your Battery™ program got her excited. She wanted to know exactly when this will happen, and how she can help. Kids natually want to help and will keep us accountable, especially if they have something to look forward to. November 1 is circled on our calendar, and I hope it is on yours too. Be prepared, pick up new Energizer® MAX® 9V batteries for your smoke detectors now so you are ready. We stopped at Walgreens this week to grab a pack. They are right by the check out so it was an easy in and out to get what we needed. Before November 1 I encourage you to talk with your kids about fire safety. 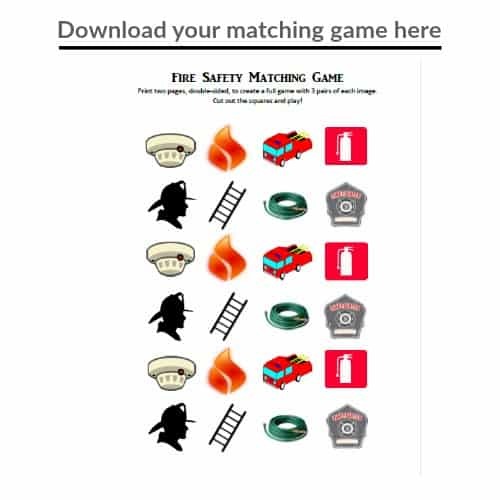 Download this fun matching game and have a conversation while playing it. Involve your kids in changing the clocks and smoke detector batteries on November 1, it’s a great opportunity to revisit fire safety and ensure your home and family are ready in case of a fire. Have you talked with your kids about fire safety? I’d love to hear more about it in the comments. Remember to Change Your Clock Change Your Battery™ on November 1.